This article investigates the possible gender agenda of Susanna. Gender is one of the most debated issues in the study of the story. A frequently asked question is: "does Susanna reinforce or undermine patriarchy?" Most scholars, mainly feminists, are pessimistic and suspicious about the subversive programme of Susanna. This study addresses the above concern using the Greimassian approach to narratives, as refined by Everaert-Desmedt. The approach comprises three levels of analysis: the figurative, the narrative and the thematic. Results from preliminary analysis appear to highlight "Jewishness" as the main concern here. True Jewishness seems to depend exclusively on the commitment to the Law, regardless of gender. A woman such as Susanna, committed to the Law even to the cost of her life, is a true Jew (θυγάτηρ Ιούδας). Men like the elders, opposing the Law, are corrupt and corrupting strangers (σπέρµα Χανάαν). Accordingly, Susanna undermines rather than reinforces patriarchy. The alternative view, which is supported only by a minority of scholars such as Craven (2001) and Tkacz (1998) on the other, maintain that Susanna "contitutes real evidence against the idea that Judeo-Christian tradition is inherently sexist" (Tkacz 1998:36). The precise aim of this contribution is to take further this second view by a thorough analysis that deals systematically with the whole narrative. To reach this objective, the study adopts a Greimassian approach to narrative analysis, as refined by Everaert-Desmedt (2007). According to the preliminary results, one of the main concerns of Susanna seems to be the redefinition of Jewish identity. The depiction of a woman as totally committed to the Law (θυγάτηρ Ἰούδας) and two men as opposing the Law (σπέρµα Χανάαν) insinuates that, according to the story, true Jewishness depends entirely on commitment to the Law, regardless of gender. Therefore, Susanna does not seem reinforce it. The following section gives a summary of the approach to be followed. Susanna is a narrative. Generally, narratives are written to make sense when considered as a whole (Kanonge 2010:25). For this reason, this study adopts the Greimassian approach to narrative analysis. The approach consists of analysing texts on three levels: figurative, narrative and thematic. The theory is too wide to be treated exhaustively. Only a summary may be given here. The figurative level of analysis focuses on figures and how they are constructed in the text. The study of figures is called figurativization. Main figures consist of actors, space and time. This level is investigated by gathering figures and observing figurative oppositions (Everaert-Desmedt 2007:30). • The study of actors is called actorialisation. It denotes the way the author constructs actors in order to captivate the audience. • The study of space is called spatialization. It is concerned with the choice of meaning space in a narrative. The narrative level of analysis examines the organization of the text as discourse. The tools of analysis at this stage consists mainly of the Actantial Model and the narrative syntax. 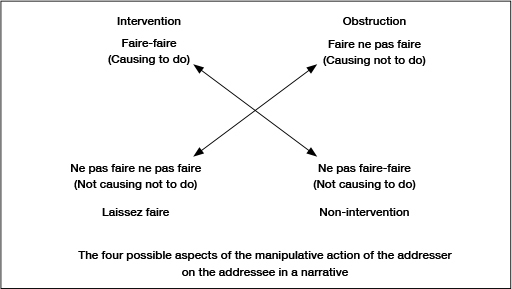 The role of the Actantial Model is to reveal different functions and activities performed in a narrative by actants (Neemann 1999:126). An actant is what produces or undergoes an action (Greimas and Courtés 1979:3). An actant can be a being or a thing. Greimas' Actantial Model presented below, consists of six actants. 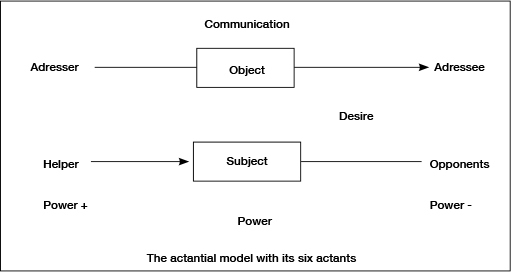 In the Greimassian approach, a canonical story comprises three axes defining different relationships between six actants, as indicated on the actantial model. A story always gives an account of the quest of a subject for an object (axis of desire). The addresser communicates the longing for the object to an addressee (axis of communication); in this communication, addressers assume three different roles in a narrative: subject adjudicator (they judge the action of the subject at the end of the story), a subject manipulator (they impart their own appreciation of the object appearing directly in the story) and a subject of state, different from the subject performer (Everaert-Desmedt 2007:46-47). The helper assists the subject in his pursuit while the opponent raises obstacles to his mission (axis of power). The narrative syntax is the description of the course of the subject in the unfolding of the narrative. It consists of the narrative programme and the canonical narrative schema. In addition, the achievement of a subject will depend on modalities which are described below. • The narrative programme is a series of actions related to the way the subject transforms her initial state into her final state. • The canonical narrative schema gives detailed steps of the evolution of the subject in the narrative. It consists of four steps: the contract, the acquisition of competence, the performance and the sanction. They are discussed in detail below, starting with the contract. • To fulfil the narrative program the subject is to possess qualifications that can stimulate and enable his action. These qualifications are called modalities. "A modal expression is one that communicates attitude" (Taylor & Van Every 1999:50). There are six basic modalities: being, doing, wanting, having-to, knowing and being-able-to (Greimas 1983:80-81). At the thematic level, the researcher will strive to uncover the fundamental values that generated the text. These values are generally expressed implicitly by a narrative. These core values, encoded in the text, constitute the vital clue of the message of a narrative. The uncovering of values is achieved by the use of the semiotic square in two perspectives: paradigmatic and syntagmatic. From the paradigmatic perspective, values in play in a semiotic universe, are classified according to the cultural axiology (good versus bad; acceptable versus not acceptable). For example if S1 stands for a good value, S2 will stand for a bad. S1 and S2 constitute the negation of S1 and S2. The syntagmatic perspective will be concerned with the circulation of these values across the text. In both steps, the semiotic square is used (Cf. Kanonge 2010). A text asserts a value, then questions it and confirms the opposed. Its thematic path is illustrated by figure A. Another text may assert a value, then rejects it to assert the opposed. It rejects the opposed as well to reassert the first value. Its thematic path is B. The following section is the analysis of Susanna. As said above, this study adopts the Greimassian approach to narratives, comprising three following levels of analysis which have been summarized above: figurative, narrative and thematic. The following section focuses on the figurative analysis of Susanna. The figurative analysis investigates main figures featuring in the story in terms of actors, space and time (Everaert-Desmeddt 2007:30). It examines how figures are constructed by the author and pays attention to oppositions between them. The way figures are established in a story is called figurativization. Figurativization of Susanna comprises a few actors, a few places and only one significant moment in time. Figures are discussed below in terms of actorialisation, spatialisation and temporalisation. Susanna consists of a number of actors namely: Joakim, Susanna, Susanna's father, Helkias, the two elders, God, the Jewish people, Susanna's maids, Joakim's household servants, Susanna's children, the fictive young man, the unnamed daughters of Israel, Daniel, and the angels. Only major actors - Joakim, Susanna, Helkias, the elders, God and Daniel - are briefly discussed below. Joakim appears first in the narration. His role in the story, however, is secondary; he surfaces only in the speech of the narrator. He performs no action and takes part in no dialogue. Only two action verbs denote his presence: "(he was) living in Babylon" (v1) and "he took a wife" (v2). These two actions establish the background of the story. His name, "the Lord will establish" (Kay 1913:647), seems to refer to his exceeding wealth (Brown et al. 2000:877-879). In the history of Judaism, however, this name has a negative connotation, being the name of a wicked king of Judah (2 Kings 24:8-9). The attribution of such a name to an actor in a fictitious story (Moore 1977:84-89) seems to be deliberate (Korhonen 2006:16). Joakim is thus an ambiguous personage. He is not explicitly depicted as good or bad. This study argues that he stands for the compromising Jew of the Diaspora, less concerned with his own Jewish distinctiveness. This ambiguous position, however, his laissez faire attitude, allows his house and his garden to play determining roles in the story as will be revealed later. The name of Susanna (Lily) (Song of Songs 2:1-2, 16; 4:5, 13; 6:2-3; 7:2) represents beauty and love (Exum 2005:112), righteousness (Farbridge 2003:46) and purity, and seems to be a metaphor for Israel (Goodspeed 1939:70). Susanna's association with Joakim, an influential person, calls to mind other heroic stories such as that of Joseph and Esther, where Israelites took advantage of their positions to help their compatriots (Mills 2006:413). Susanna's "extreme beauty" (אαλὴ σΦόδρα) and "fear of the Lord" (Φοβουµένη τὸν אύριον v2) are central to her action in the narrative (Bohn 2001:259). The use of beauty to kill the enemy is not unique to Susanna and Judith. The unique difference, however, lies in the fact that Susanna achieves this goal passively while Judith acts with purpose. Φοβουµένη τὸν אύριον (fearing the Lord), the feminine form of Φοβούµενος τὸν אύριον, occurs only once in the entire LXX. The corresponding masculine formula appears about ninety four times, chiefly in Psalms (30 times) and in Ben Sira (24 times). Φοβουµένη means that Susanna is exceptional. Susanna's fear of the Lord comes to light in her reaction to the "elders' coercive proposal in the garden" (v22 cf. Tkacz 2010:40-41). The phrase "Στενά µοι πάντοθεν" (I am in straits on every side) appears only in Susanna 22 and in 2 Samuel 24:14 (with its parallel in 1 Chronicles 21:13). Tkacz (2010:43-47) credits Susanna with an insightful and self-confident paraphrase of King David. Susanna's "lifting of eyes to heaven" (ἀνέβλεψεν εἰς τὸν οὐρανόν) reveals her trust in God (v35). Her view of God dominates the story. She believes in the omnipresence of God (23), His transcendence, His control over the entire universe (Traub 2000 5:519), His eternity, His omniscience and His omnipresence (42-43). Susanna is called progressively θυγάτηρ Χελאιου (daughter of Helkias v 2, 3 and 29), θυγατέρα Ισραηλ (daughter of Israel v 48) and θυγάτηρ Ιουδα (daughter of Judah v57). These identifications disclose the progressive revelation of her identity. They are possibly intended to give credit to Susanna as a legitimate member of the community, on the basis of genealogy, her connection with a religiously outstanding family (v3). And indirectly, they address gender discrimination in the Jewish community, namely the idea that a woman only has standing in the community because she is somebody's daughter. She does not have standing in her own right. (Oepke 2000:781). As in other stories such as Judith and the Additions to Esther, the portrait of Susanna that emerges from the story contrasts sharply with the conventional representation of women of her time (Jordaan 2009:1-6). Indeed, the whole Jewish community depends totally on her action for the preservation of its traditions and thus of its identity (Kanonge 2010:85). The third actor is Χελאιας, Susanna's father. His role seems to be minor in the story, but his influence on Susanna is decisive. His name means "the Lord is my portion" (Kay 1913:647) and has a positive connotation in Jewish traditions and history, being the name of the high priest responsible for religious reform of Josiah's time (2 Kings 22-23). The absence of names is their first prominent characteristic and probably means they are without stereoptypes (cf. Cornwall & Smith 1998: vi). "Elder" seems to be an allusion to the institution rather than to the age of the individuals (Steussy 1993:109). They probably represent the compromising leading class of the Diaspora. In fact, their association with wickedness (v5) is incompatible with their function as judges, protectors of people's rights (Jordaan 2008:121). Their main aim as Law-breakers (Dancy 1972:233), as well as their metaphorical gesture of "turning their eyes against heaven" (v9) means "the rejection of God's will" (Dancy 1972:227). Their portrayal as "seed of Canaan" (Σπέρµα Χανααν) contrasts with their authentic image and mission in Israel, as a badge of Jewish identity. God is depicted as being concerned about wickedness in the Jewish community (v5). He is called respectively ὁ θεὸς, (God), ὁ δεσπότης (the Lord) and ὁ אύριος (the Lord). In the narrative, He is mainly revealed through Susanna's point of view, specifically in her prayer. This likely suggests that among all the actors, Susanna is the one who knows God better than other actors. Daniel, meaning "God has judged" (Moore 1977:108), is the last major actor to appear in the story. His introduction, following Susanna's prayer, appears as a special act of God's intervention on behalf of the latter. Daniel "is not the hero here but Susanna is" (Moore 1977:90-91). He represent the intervention of the Lord. Apart from these main actors, there are other minor actors such as the unnamed Susanna's mother (Tkacz 1998:35); Joakim's servants and Susanna's maids used stereotypically to underline Joakim's wealth; Susanna's maids serve also as a patriarchal mechanism of women's control; Susanna's children, together with her parents and her husband serve to reject the wisdom motif of the "loose woman" which is falsely ascribed to Susanna (Kanonge 2010:94). The angels (God's messengers) represent the presence, the authority of God and his justice. The daughters of Israel are likely used to show that the community was already invaded by wickedness. The following section discusses spaces in which actors are placed to contribute to the meaning of the story, in terms of spatialisation. Noticeable places are Joakim's house and Joakim's garden, Babylon and heaven. Heaven also plays an important role in the story. It is the direct opposite of Babylon. Heaven, for the elders, is a place to avoid, but for Susanna, it is the place where help comes from. Heaven refers to God. Joakim's house is the place where the action starts. Moving from this space symbolises the beginning of the quest for the protagonist (Hénault 1983:133). Apparently Susanna goes out unveiled; otherwise, the elders could not have noticed her beauty (31). Being unveiled outside her house adds to her unconventionality. Social convention of the time stipulated women to leave the house veiled. The implication being that an unveiled female would be a temptation to men (cf. Ilan 1995:129-130). The choice of this space is expressive of its strangeness. The garden, because of its ambiguity as public and private, can be an appropriate place where women and men meet by chance. It is used metaphorically by the author as a battlefield where ingrained prejudices against women are deemed to be reversed. Susanna's close connection with the garden (παράδεισος) is very important in the narrative because it calls to mind the Garden of Eden. It is here, according to biblical traditions, where a woman introduced sin in the humanity. But here a woman resists sin. The use of time in Susanna is discussed below, in terms of temporalisation. The use of time in the story is limited to a unique period of time, µέσον ἡµέρας (noon). µέσον ἡµέρας is a liminal time. It is "a time of enchantment when anything might, even should, happen" (Turner 1979:465). It is the time when the garden is accessed by Susanna and the barriers between men and women can be broken. 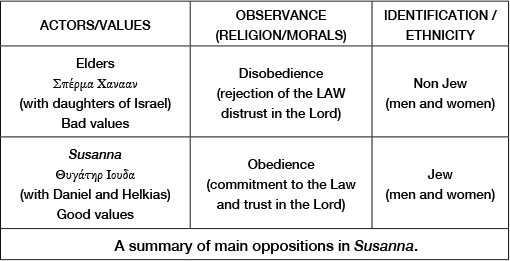 The following section explores figurative oppositions in terms of contrasts between Susanna and the elders. Oppositions here depend on the concern raised by the story in verse 5: wickedness has come from Babylon. Wickedness here refers to adultery, one of the three sins (with idolatry and eating pork) a Jew must avoid even at the cost of his life (Mackenzie, quote from Moore 1977:91). In this regard, depending on their attitude to the Law, Susanna and the elders represent opposing values: observance versus non observance. Oppositions culminate with the depiction of Susanna as θυγάτηρ Ιουδα on one side and the elders as Σπέρµα Χανααν on the other. These expressions depict people according to their dedication to the Law, regardless of their gender. In other words, Jewish society and thus Jewish identity is structured around obedience/disobedience to the Law, regardless of gender. Women, such as Susanna who uphold the Law at the cost of their life are Jews. She is "a daughter of Judah", the badge of Jewish identity. Men such as the two elders who reject the Law are, "the seed of Canaan", and the emblem of non-Jewish identity. The above results constitute but a partial analysis of the story - the figurative level of analysis. The two steps of analysis are undertaken in the following sections. As said above, this second step consists of the actantial model and the narrative syntax. According to verse 5, God focuses the attention of Jews on the importance of the Law (v5); the Law seems to be the object of the story. In fact, the main theme is the observance of the Law. The actant whose role is to underline the importance of the object is the addresser. Susanna exemplifies unfailing longing for the maintenance of the Law. The actant whose function is the pursuit of the object is the subject. Susanna's commitment to the Law runs against the elders' wickedness: they are opponents to her action. Susanna succeeds in her endeavour with God and Daniel's intervention. These are helpers and the Jews are the addressees of the story because the message of the Lord (v5) is destined for them. The story starts with the Lord's warning (v5) and ends with praising God (60). God assumes all three traditional functions of the addresser. He appears in the story as a subject adjudicator, a subject manipulator and a subject of state (Everaert-Desmedt 2007:46-47). As a subject of state, God is different from Susanna, the subject performer. He imparts his own appreciation of the Law without appearing directly in the story. His involvement is distant (Gruen 2002:172). However, remote action in this case entails manipulation not disinterestedness. In fact, God acts in accordance with his status as a subject manipulator. The word "manipulation" is a technical term hereafter. There is no connotation of dishonesty or deception. A manipulator here is a remote causer. Intervention, obstruction, non-intervention and laissez faire are indicative of the action of the addresser. God acts accordingly here. It is worth noticing that when wickedness appears, God informs the Jews (v5): this is a faire faire (causing to do). Finally, at the end of the story, God plays the role of an adjudicator. In fact, at the end of the narrative He receives praise (v60). In brief, a superficial reading of Susanna may conclude that God does not appear actively. Contrarily, a semiotic investigation sees His intelligence everywhere in the story. His direct intervention (faire-faire) as well as his non-intervention (ne pas faire-faire), his obstruction (faire ne pas faire) as well as his laissez faire serve his design. The object is the Law, as said above. Susanna's quest is commitment to the Law. In the Greimassian approach, the subject of a story, is the actor longing for the object. In this case Susanna's commitment to the Law qualifies her as subject of the story. Some actants (helpers) help Susanna to succeed in her quest (God and Daniel), while others (opponents) attempt to counter her enterprise (the two elders). As in many biblical stories, God does not act directly. Daniel as παιδαρίου νεωτέρου (mere child) (45) elucidates the point. Success does not lie in his capability, but depends on God's inspiration. In fact, he "convicts the elders even before questioning them" (Gruen 2002:172). This section was concerned with the actantial model focusing on Susanna as embodiment of Jewishness. Her liberating process constitutes the narrative syntax as discussed below. This section focuses on the journey of Susanna in the narrative. It considers the narrative programme, the canonical narrative schema and the encounter of subjects in Susanna. The narrative programme is a series of actions related to the way Susanna transforms her initial state into her final state (Martin & Ringham 2000:91). In this process Susanna goes from blame to commendation, exclusion to inclusion and from negation to recognition of her Jewishness (v62). The main narrative programme highlights the quest of the story while the canonical narrative schema gives detailed steps of the evolution of Susanna in the narrative. It consists of four steps: the contract, the acquisition of competence, the performance and the sanction. They are discussed in detail below, starting with the contract. The contract describes the moment Susanna became aware of the importance of the Law for Jews. Susanna studied the Law from her parents (2-3). From then on, she is described as "Φοβουµένη τὸν אύριον" (fearing the Lord). Her decision to stay true to God instead of succumbing to the elders' advances proves that she was already in contract with God. In some Biblical stories, God speaks directly to an individual and gives him or her a mission to accomplish (Exodus 3:7-10). There is an explicit contract. The contract in Susanna is implicit, focusing primarily on the desire of the addressee to accomplish a mission rather than on duty. God's manipulation in this case is indirect and consists of laissez faire. That is, "the initiative seems to rest with the causee; the causer does not need to do anything, but only to refrain from preventing a particular action by the causee" (Kroeger 2004:207). In brief, the contract is established between God and Susanna first by her knowledge of the Law that produced the fear of the Lord: duty (having to do). The second stage corresponds to the prophetic utterance from the Lord (5). This utterance helps Susanna to kindle her fear of the Lord. It moves her from duty to desire, vouloir faire (wanting to do). From then on, she moves from the state of addressee to a virtual subject, ready to resist wickedness and thus reverses the established negative view of women. The contract examined the awakening of Susanna as to become a potential subject to resist wickedness. At this second step, however, Susanna needs more than just virtualising modalities: duty and desire. She needs two indispensable actualising modalities: pouvoir faire (being able to do: power) and/or savoir faire (knowing how to do: skill). Her irresistible beauty, her knowledge of the Law (fear of the Lord), her unfailing trust in the Lord and her appeal to Him in prayer stand for these two capabilities. Beauty is innate and constitutes a deadly trap to the anti-Law. Some scholars such as Mieke Bal (quote from Levine 2004:313) consider Susanna's beauty as the origin of the elders' fall. Verse 5, where the elders' wickedness is exposed even before Susanna's moving outside, rejects this view. Susanna's second capability is her fear of the Lord. She considers allegiance to the Law more important than her life (v22). With this as a driving force, the elders' intimidation and threats to kill could not bend her determination. Her third capacity is her unfailing trust in the Lord. Her trust emerges from the story through the verbs πείθω (to be convinced) (v35) and ελπίζω (to trust) (60), suggesting that she knows that the Lord always intervenes to save those who remain faithful to the Law, namely those who trust Him (v60) (Kanonge 2010: 163). Last, but not least, Susanna's prayer plays a central role in her achievement. Susanna's prayer and her cry emerge as her savoir-faire (knowing how to do). Some scholars, including Gruen, see no optimism in Susanna's prayer. According to Glancy (2004:3002), however, Susanna's prayer "shapes the direction of the plot". Beauty, the Law, trust in the Lord and prayer emerge as the driving forces behind Susanna's success. These elements help the heroine to resist wickedness and indirectly, save her community from wickedness. The term performance designates the event to which the story has been leading. It is by carrying out the performance that the subject acquires (or fails to acquire) the object of value (Martin & Ringham 2002:100). Here, Susanna must use the abilities discussed above to achieve her mission. Susanna's first and decisive step in achieving her mission is her encounter with the elders in the garden (paradise). This setting evokes sin and is generally associated with Eve, the first woman. Contrary to the story of Eve, Susanna enters the paradise not to sin, but to counter-act men's wickedness. This reversal is the central concern of the story. Susanna's rejection of the elders' advances, however, does not solve directly the problem of wickedness, rather it puts her at risk. Her death could have had bad consequences for the community. The programme of preserving the Law she championed would have been interrupted. At first Susanna is condemned to death but remains silent. Her silence however, is the expression of trust in the Lord (35), rather than weakness. Accordingly, she lodges an appeal to God and changes her own destiny and that of her nation. God enters the scene to side with Susanna, no longer as a distant addresser, but directly involved as Helper. He causes Daniel to question the decision and reopen the investigation, playing the role of a helper who, depending on the problem facing the subject, can be an agent or an instrument, a human being or a spiritual being such as an angel (cf. story of Tobit). you know that they framed me. Must I now die, being innocent of what they have so maliciously charged against me? (43). This means Susanna formulates her prayer not as an affirmation but as a rhetorical question. To such a question, the answer is "certainly not". Thus, Susanna's prayer expresses assurance rather than despair as Gruen pretends (2002:172). Daniel's intervention reveals God's intention to expose wickedness. In semiotic jargon it is a faire-savoir (causing to know). It is the moment where the wicked programme of the elders is revealed and interrupted in favour of the maintenance of the Law of Moses, championed by a woman. Susanna was not just found innocent of the act of adultery: her conduct was found above reproach, i.e. she had in no way encouraged the lecherous men or been responsible for their advances toward her (Moore 1977:113). It emerges from this sanction that Susanna makes a strong case against sexist prejudices according to which women were wicked and responsible for potential adultery. In the thematic analysis, the aim is to map out the core values that generated Susanna. The main device of investigation here is the semiotic square. This mechanism will serve first to classify values and second, to track their trajectory. The above semiotic square highlights the impossibility of rejecting the Law and remaining a true Jew. Unexpectedly, the legal spokesperson of true Jewishness is a woman, Susanna. However, the official representatives of non-Jewishness are two men, two leaders. Being a Jew here does not depend on gender, age, social class or even genetics. Structuring the story as to have a woman representing true strict observance and thus Jewishness in a dominated patriarchal context, can hardly lack a gender agenda. The central concern of Susanna is possibly the following: "Who is a true Jew?" (Kanonge 2010:380). To this question, data from the text allows an unequivocal answer: "Neither exclusively a man nor a woman, but a person male or female adhering to the law". The following section focuses on the circulation of these fundamental values in the story. The first dimension of the thematic analysis focused only on the classification of opposing values in Susanna. 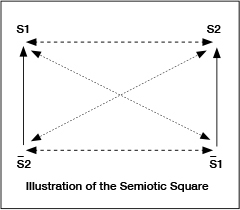 The semiotic square is now used to track their trajectory, from the initial state to the final state. The concern is to find out which values the story seeks to reject, and which it seeks to maintain. Commendable values generally complete their course in a narrative but non-commendable values stop halfway (Kanonge 2010:5861). 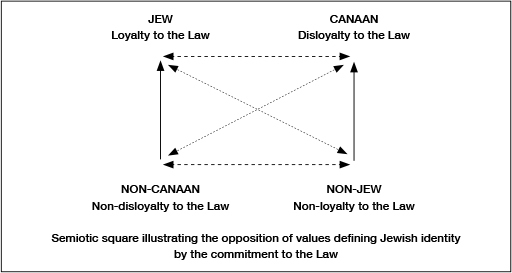 As said above, Susanna reveals two opposing attitudes with regard to the observance of the Law of Moses: loyalty (Jewishness) and disloyalty seed of Canaan). The following part of the study focuses only on the itinerary of Jewishness, following four main segments of the story (Kanonge 2009:366). While Canaaniteness stops its trajectory halfway, Jewishness achieves its course successfully. A. The story posits the Law as the unique criterion of Jewishness (2-14). Susanna is catalogued as Φοβουµένη τὸν אύριον precisely because she was educated according to the Law (v4). B. Having posited the centrality of the Law, the story proceeds to its negation thereafter (15-27). The challenge to the Law appears firstly by the appearance of wickedness (5) and in the proposition made by the elders to Susanna. Secondly, Susanna's refusal opens the possibility of another dimension of rejection of the Law: false witness and arbitrary murder. On the semiotic square, this is a transitional step toward Canaaniteness, complete rejection of the Law. C. Following the questioning of the Law is now its complete rejection (2844). The story does not only highlight the attempt of the elders to act unlawfully, but also their manipulative design to involve Jews in their decision. Subsequently, Susanna undergoes a wicked judgement and Jews unanimously approve her sentencing to death. Consequently, the Law ceases to be the centre of Jewish life. In practice, Jews disavow their Jewishness. Canaaniteness is now their distinctiveness. Fortunately, the thematic course of the story does not end here. The story rejects the attempt to establish a way of life opposing the Law, as is revealed in the last episode by the intervention of God through Daniel. D. The last episode (45-63) emphasizes the questioning of the elders by Daniel. Only this episode and the first episode refer to a direct intervention of God, evidenced by two important verbs of action, both of them implying a manipulative causation v5 ἐλάλησεν ὁ δεσπότης (the Lord caused to know) and v45 ἐξήγειρεν ὁ θεὸς (God caused to arouse). The first episode focuses on the centrality of the Law while the last episode negates the attempt to adopt the Babylonian way of life (Canaaniteness). Negation of Canaaniteness implies affirmation of Jewishness. Consequently, this episode rejects the two elders' wickedness (Canaaniteness) and commands Susanna's commitment to the Law (Jewishness) as fundamental to Jewish identity. From the thematic analysis ethnicity is clearly singled out as the main issue Susanna seeks to address. Susanna strives for the conservation of Jewish identity exemplified by the commitment to the Law in opposition to the attempt to adopt a Babylonian way of life. The centrality of a woman depicted as epitome of Jewishness reveals that gender is rejected in the redefinition of Jewishness. To the question "who is a true Jew", as said above, data from the text allows an unequivocal answer: "neither exclusively a man nor a woman". It is clear here that Susanna reads as "a gender equalising narrative" (Kanonge 2010:192). The concern of this study was to address the follow question: "does Susanna reinforce or undermine patriarchy?" To answer the question, the Greimassian approach was followed. At each of the three levels of the analysis - figurative, narrative and thematic - the results were conclusive; it was revealed that the main concern of the story was Jewish identity. In fact, the depiction of a woman as embodiment of the Law (true Jewishness) and two men as incarnation of wickedness is revolutionary. It indicates that gender is deemed irrelevant in the redefinition of Jewish identity. That is, with regard to being either true Jew or not, men and women are equal. Therefore, this study supports the contention that Susanna is an equalizing story and takes this view further. 1 This article is part of the author's postdoctoral studies at the North-West University, under the supervision of Prof Pierre J. Jordaan. It is a part of the third chapter of the author's PhD thesis presented at the Potchefstroom Campus of the North West University (South Africa) under the supervision of Prof Pierre J Jordaan, in 2009. The text of Susanna that will be used here is essentially the Theodotion version. This version has a most elaborate narrative focussing more on Susanna than the LXX does. In this study, Susanna (italicized) refers to the story of Susanna while Susanna (non-italicized) refers to its female protagonist. The apocryphal story of Susanna is an addition found at the end of the Greek book of Daniel in the LXX (cf. chapter 13). The LXX Greek text is quoted from Rahlfs' (1996) edition of the LXX. 2 This article uses Greimas' original French terms to refer to modalities, with an English translation.